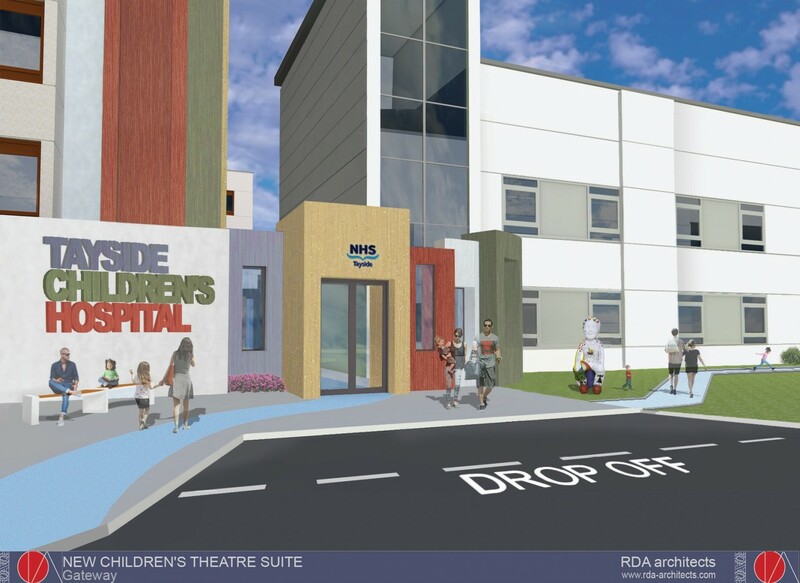 NHS Tayside have submitted an application to build a mew paediatric theatre, services and landscaping at Tayside Children’s Hospital, Ninewells, Dundee. Plans drafted by RDA Architects call for the creation of a ‘gateway’ entrance feature and 454sq/m rainbow clad extension to double existing theatre space. This will allow a variety of new facilities to be included such as play areas, assisted bathing zones and quiet rooms on the site of existing laboratory facilities. Scheduled to open in 2020 the £6.5m extension and renovation project is expected to start construction in the summer. I think 1985 wants their graphics back. Be amazed if there is a spade in the ground this side of 2020! I think its fair to assume that this is a visualization of the contractors proposed site entrance with turnstile? What does the proposed building look like?